Without its slick OS, the Nexus 5 would be just another top-of-the-line Android phone. The Nexus 5 takes the very best that Google has to offer and wraps it in a dull, plastic shell. It gives us the sweet nectar that is stock Android but presents it to us in a generic body that doesn't feel special. The phone is excellent and can easily hold its own against Samsung's Galaxy S4, Apple's iPhones, and all of Nokia's Lumias, but there's little here that we haven't already seen in other high-end smartphones. If it weren't for the software, the Nexus 5 would be just another Android phone. As someone who's toted an iPhone 5 around for the past year, I have to say that using the Nexus 5 was a breath of fresh air. The Nexus 5's 4.95-inch 1920-by-1080-pixel display looks crystal clear and puts the 4-inch display on the iPhone to shame. Text is clear, colors pop, and the screen is readable even in bright sunlight. There's one caveat, though: The screen isn't very bright. On anything other than the highest brightness settings, the Nexus 5's display looks dark and unimpressive. Though turning on auto-brightness will save some battery life, it'll also make the screen appear dull and ordinary. If you pick up a Nexus 5, I recommend cranking the screen brightness up to max and disabling the auto-brightness to get the most from the phone's high-resolution display. The rest of the phone's hardware isn't especially noteworthy. It feels solid enough to survive a few falls out of your pocket, but the design doesn't stand out compared to that of the HTC One or the iPhone. Even Nokia's colorful Lumias have more personality, as the Nexus 5's plain black (or white) color scheme makes it as faceless as countless other Android phones. In many ways, LG could have taken the chassis it used for the G2, shaved off a few bits here and there, and carved "NEXUS" into the back to produce this model. As one my colleagues noted when I was writing my first impressions of the device, the Nexus 5 is "plastic, yet not unapologetically plastic like the iPhone 5c." Though the phone doesn't feel cheap, neither does it feel high-end. The ceramic volume and power buttons rattle when you shake the phone, and the giant "NEXUS" logo emblazoned on the back looks tacky. The Nexus 5 doesn't get greasy the way the iPhone 5c and the Samsung Galaxy S4 do, but the soft rubber-like finish does attract lint and crumbs, so you'll have to be careful where you set the phone down. You'll also need to be wary of the Nexus 5's protruding camera lens, which sticks out slightly from the rest of the phone and prevents it from laying completely flat. The lens cover is completely exposed and I worry that it'll be the first thing damaged should the phone decide to take a quick trip from your pocket to the sidewalk. Google sells bumper cases that help the lens sit more nearly flush with the rest of the phone, but this shortcoming could have been solved at the design stage. The phone's slim profile does make it easier to pocket and hold in one hand, but I had trouble reaching the power button without adjusting my grip. If the power button were just a millimeter or two lower, I wouldn't have had to strain my hand every time I wanted to wake the phone or put it to sleep--and I don't have small mitts. Using the Nexus 5 one-handed proved somewhat difficult, as I couldn't quickly reach the notification shade; and typing with one hand made the phone feel unbalanced. I faced a similar problem when I evaluated the Galaxy S4 for a hands-on review: The Galaxy S4's razor-thin bezels prevented me from getting a solid grip on the phone without inadvertently hitting the edges of the screen. Although the Nexus 5's design is unassuming, the hardware inside the phone is on a par with what other flagship Android phones offer. The 2.26GHz Snapdragon 800 processor absolutely screams, and it handled everything I threw its way. It had no trouble pushing all those pixels on the big, beautiful display, even as I watched HD movies and played games like Dead Trigger 2. Last year's Nexus 4 was a capable device, but it overheated if you so much as looked at it funny. On the Nexus 5, I played Dead Trigger 2 for more than an hour--and watched the first half of Pacific Rim--and the phone got only slightly warm. And most of that heat was from my holding onto it for so long. Like the cameras on the Nokia Lumia 1020 and 920, the Nexus 5's 8-megapixel camera benefits from optical image stabilization (OIS). Even if you don't have shaky hands, OIS on the Nexus 5 lets you take better low-light photos, and videos that don't look as though you were rocking in a boat on the high seas when you snapped them. Nexus phones aren't renowned for their photo-taking capabilities, but the Nexus 5 can produce very good-looking images. The quality is about equal to what we've seen from the iPhone 5/5s; you'll still get better low-light performance from the HTC One or Nokia Lumia 1020. Photospheres make a return, but there's no slow-motion video recording as on the iPhone 5s, Galaxy S4, or HTC One. 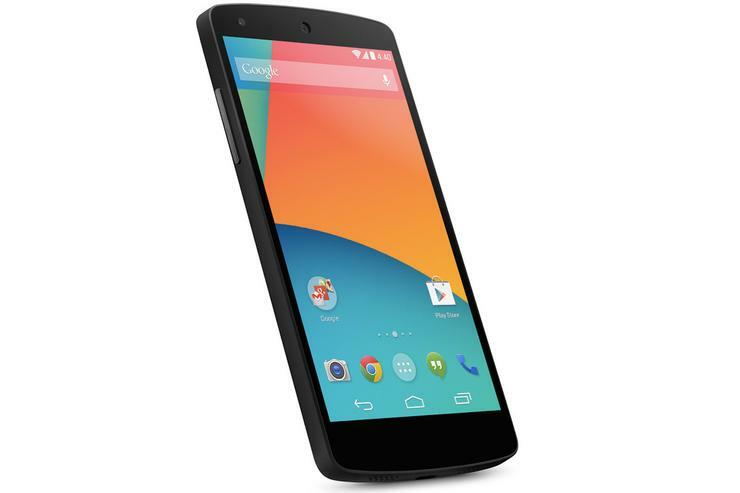 The Nexus 5 is sold unlocked, and it accepts any micro SIM you might have lying around. It will work on all major Australian 4G networks including Telstra, Optus and Vodafone. We haven't put the Nexus 5 through a full round of battery life lab tests yet, but I got through roughly 7.5 hours of use on a single charge. During that time I had Wi-Fi enabled and the screen brightness set to max, and I played a lot of games. Your mileage will vary, but you should be able to get a full day's use out of the phone. The Nexus 5 doesn't come with a replaceable battery, so you'll have to use an external battery pack to extend its life further. From a hardware perspective, buying the Nexus 5's hardware amounts to buying a repackaged LG G2 with a new camera and a smaller battery. What makes the Nexus 5--and the Nexus line in general--so noteworthy is its software: This is the first device to run Android 4.4 KitKat, the latest version of Google's mobile OS. Even if you're familiar with earlier versions of Android, KitKat will feel like a new world to you. KitKat is the reason to pick up a Nexus 5. It seems smoother than even Android 4.3 Jelly Bean, and KitKat's aesthetic tweaks help make it feel modern and sleek. Google Search has been pushed to the forefront, and a new home screen is dedicated entirely to Google Now. If you were envious of the Touchless Controls on the Moto X, you'll be pleased to know that KitKat includes a similar feature that lets you dictate Google searches from the home screen by saying, "Okay Google," followed by your query. It's not exactly the same, though, since the phone needs to be awake and on the home screen--which means that it's not as useful when you're driving or when your hands are otherwise occupied. The feature does let you issue simple commands to your phone, so you can compose email and text messages, but you'll often have to touch the screen to finish the job--and you still can't use it to toggle your Wi-Fi on or off. A number of changes in KitKat seem to be Google's unsubtle way of pushing people to adopt its ghost town of a social network. The most disconcerting of these changes involves the removal of the standard Messaging app in favor of Hangouts. Formerly Google Talk, the Hangouts app now does double duty as both your IM and your primary text-messaging client. Combining the two clients makes sense on paper, but the execution is a bit flawed. When you start typing someone's name to compose a new message, you'll be shown not only the contacts stored on your phone, but also people on Google+ who share the same name as the person you're trying to reach. Your contacts show up first in the listings, but the Google+ recommendations will confuse people who just want to send a text to their friend, only to be asked which of 500 people named Albert they want to contact. The Nexus 5 is an attractive smartphone with an appealing price that will surely persuade many people to pick one up. Though the hardware is fairly mundane, the software will draw attention. Android 4.4 KitKat represents a significant evolution in Google's OS, and it sets the Nexus 5 apart from the rest of the Android pack.